The DIRECTV upgrade to Genie from Signal Connect delivers the ultimate viewing experience! Get superior satellite TV technology with our DIRECTV upgrade to Genie. Our DIRECTV upgrade to Genie is for anyone with a residential DIRECTV install that uses older hardware. DIRECTV has already stopped making most non-Genie equipment, so when it’s gone, it’s gone for good. A DIRECTV upgrade to Genie from us provides you with the best possible reception and viewing experience. If you plan to continue to enjoy all your DIRECTV programming, you need to get the Genie upgrade. We’re here to help you with our DIRECTV upgrade to Genie plan. Some people haven’t taken advantage of our DIRECTV upgrade to Genie because they don’t know what Genie technology is. The Genie is a satellite receiver and DVR that’s superior to your previous-generation hardware. The Genie brings you DIRECTV satellite programming to every room of your home. It lets you record five programs at the same time, get on-demand programming, and store up to 200 hours of HD programming. The Genie also handles all recording and reception tasks while people in other rooms get to watch anything live or recorded. Viewers in other rooms also get to pause live TV and watch on-demand content from this silent, tiny box. Genie clients can be wired or wireless, depending on your needs, and these units are about the size of a tablet. There is such a thing as a DIRECTV Genie upgrade for free, but it’s rare. To get the free upgrade, you have to be eligible according to DIRECTV’s rules for free hardware. This includes having the same number of TVs and you’re already paying DIRECTV’s Advanced Receiver Services fee. If you’re upgrading from old, standard definition equipment, you’ll be paying more for your Genie upgrade. How much more depends upon your circumstances. The catch is, you’re going to have to pay that fee sooner or later when DIRECTV phases out its old technology. Our DIRECTV upgrade to Genie plan puts you ahead of the game. You’ll enjoy the higher-quality satellite TV experience that Genie provides before the DIRECTV blackout forces you to switch. And once you experience the difference in technology, you’ll wish you would’ve upgraded sooner. Best of all, Solid Signal makes the entire DIRECTV upgrade to Genie process an easy one. When you go through us, you’ll talk with a real person on the other end of the line who’ll walk you through the upgrade and quickly get you connected. You’ll be enjoying your DIRECTV Genie upgrade in no time! If you want to enjoy DIRECTV 4K Ultra HD, then you’ll need our DIRECTV Upgrade to Genie. The 4K Genie Mini lets you watch DIRECTV 4K programming on any compatible 4K TV. It also allows you to enjoy all of your DIRECTV programming and full DVR functionality on a connected TV. 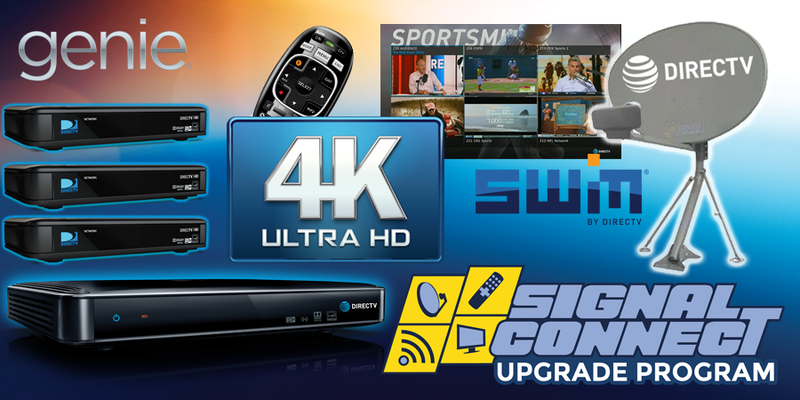 As a premier DIRECTV Authorized Dealer, we have everything you need for your DIRECTV upgrade to 4K Ultra HD. 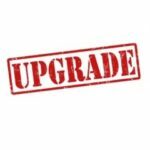 We also have all the tools, equipment, and expertise to help guide you through the upgrade process. 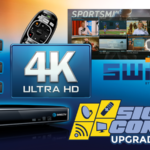 Get Your Signal Connect DIRECTV Upgrade to Genie Today! So if you’re wondering how to upgrade DIRECTV to Genie, the answer is simple. Pick up the phone and call Signal Connect and tell our team that you’re ready for the DIRECTV upgrade to Genie. If you want to know how to upgrade DIRECTV to HD or 4K, the answer is the same. Call us at 866.726.4182 or fill out the form below and talk to one of our trained technicians who’ll help you with your DIRECTV upgrade. 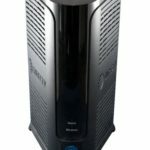 DIRECTV Equipment Upgrade for Free?